I originally saw this movie at IMAX and thoroughly enjoyed this instalment of Harry Potter and revisiting it again on Blu-ray left me with the same emotions and enjoyment levels. However there are a few things that I need to get off my chest about Harry Potter and the Deathly Hallows PART ONE! First, director David Yates and friends did a wonderful job at recreating the final novel to film, however this movie has quite a bit of “filler” to it. At times, Harry Potter and the Deathly Hallows Part One reminds of The Lord of the Rings where Frodo Baggins and Sam Gamgee keep walking and walking and walking. This in turn is replicated by Harry and Hermione as they continue to evade the Death Eaters and look for a way to destroy the Horcrux. Second, with some careful editing, I personally believe that the final book could have been sustained as one movie and Hollywood reasoning aside, this would have been possible. Although I’m sure the “box office” was happy to split the movie, even though it was a little long. Lastly, this highlights the problem of splitting the final book into two movies because just when the movie has captured you, hook, line and sinker, it ends and thankfully, they refrained from displaying the words “… to be continued” like Back to the Future 2. So enough rambling… what about the movie? Harry Potter and the Deathly Hallows Part One was a decent movie which once again came to life on Blu-ray and unlike the previous films which revolved around Hogwarts, we now see a bigger world of magic and some of the questions from Harry Potter and the Half-Blood Prince are finally answered… even though more questions are thrown into the mix. It works well though. As just about everyone in the world has read Harry Potter, I’ll still keep the spoilers to a minimum but the story begins with a bang as a group of close magical associates to Harry plan on getting him to safety in order to avoid the all seeing eyes of Voldermort. Unfortunately things go awry and after a certain wedding gets interrupted, Harry, Ron and Hermione decided to take matters into their own hands by searching for the remaining Horcruxes of Voldermort which are littered throughout the lands. Not only are these items the key to Voldermort’s power, they must somehow be destroyed in order to end the terror of Harry’s nemesis. This is where the Deathly Hallows comes into play, three magical items created by Death and Voldermort wants control of one of them. Through a carefully scripted CGI animated moment in the film, Hermione recounts the story of the Deathly Hallows and how three brothers attempted to cheat death. In return, they were given a resurrection stone, a cloak of invisibility and an unbeatable wand. 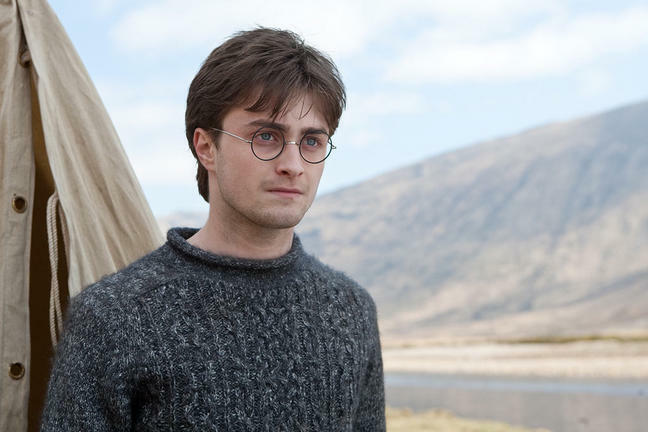 Voldermort of course is after the wand to finally defeat his thorn, Harry James Potter! Even if you have read the novels, you will still be enthralled by this movie and best of all, it’s still quite accessible to those who have never touched a J.K. Rowling book. The characterisation between the three protagonists, Harry (Daniel Radcliffe), Hermione (Emma Watson) and Ron (Rupert Grints) is a treat to watch and more significantly, these young actors have truly blossomed as actors in their own right. 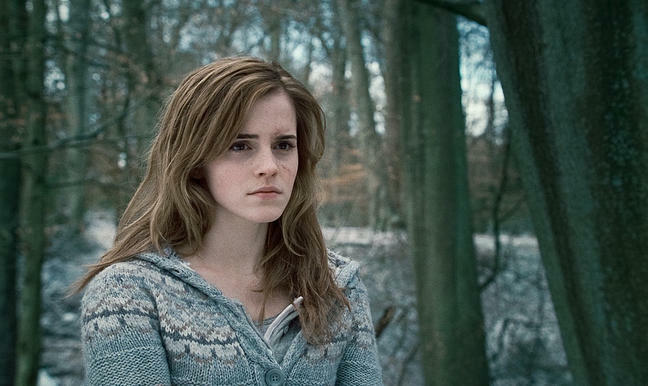 The star of Harry Potter and the Deathly Hallows Part One is Hermione. As opposed to the brash, comical and headstrong Harry and Ron, Hermione is their light and sense of reason. She also steals many of the scenes in this movie that really pull at your emotionally heartstrings such as asking Harry to stay with her to grow old or making her parents forget that she ever existed. It’s the scenes like this that make Harry Potter and the Deathly Hallows such a good movie but let’s not forget the villains! Another interesting performance is Helena Bonham Carter as Bellatrix Lestrange, the vile witch of Voldermort. There is quite a disturbing scene with Ballatrix and Hermione near the climax of the movie and if ever there was an actress to play this character, Bonham Carter nails it perfectly. The villains are definitely more vile in this instalment of Harry Potter and we even see quite a bit more of Voldermort... bless his cold hearted soul. 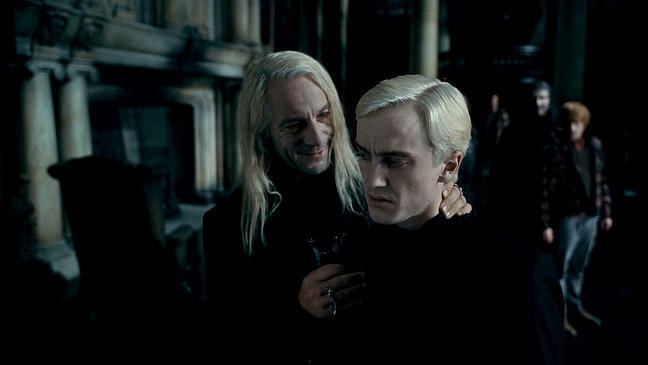 The character Rufus Scrimgeour (Bill Nighy) sums up this movie perfectly and to quote a line, “these are dark times… there’s no denying” which mirrors the torturous scene at Lucius Malfoy's Castle as Voldermort orders his viper Nagini to consume Muggle Studies teacher Charity Burbage. Nagini has another awesome scene later on during the movie which made almost everyone in the audience jump out of their seats which was good timing. It may be dark but you're pretty much guaranteed a resolution... with the soon to be released PART TWO which isn't a long wait now. Even though the movie is a little long (156 minutes), it is a well written story and in all this darkness, there is still a touch of comedy and some great character development which will guide you through this movie. To compliment the wonderful trio of Radcliff, Watson and Grints, there are some entertaining and sometimes over the top performances by some of the more veteran actors such as John Hurt, Alan Rickman and Ralph Fiennes as Voldermort. Finally, you have the amazing sets, special effects and cinematography. Director David Yates and co should be commended in bringing Harry Potter and the Deathly Hallows to life. Not once was I bored while watching this movie and it held my attention from the action packed beginning to Voldermort’s victory scream at the end. Of course on Blu-ray, you are treated to a visually superior movie that dare I saw reeks of reference quality material with exceptional picture quality <INSERT>, audio to die for <INSERT> and more importantly a wealth of special features that will make even non-Harry Potter fans smile like a Cheshire cat. Warner Bros. really pulled out all their bells and whistles for this release that include a plethora of additional scenes, a very cool tease of Harry Potter and the Deathly Hallows Part 2 and my favourite, the maximum movie mode. This mode allows you to watch the movie with interaction from some of the cast and crew of the movie that takes you well behind the scenes and give you a thorough insight into the Harry Potter universe. With even more featurettes, Harry Potter and the Deathly Hallows Part 1 is definitely a must have a release for those fans of this amazing series. Highly Recommended! Exclusive Sneak Peek of a scene from the highly anticipated upcoming film Harry Potter and the Deathly Hallows - Part 2. Maximum Movie Mode - Join host Jason Isaacs (Lucius Malfoy), and other members of the cast and crew, on an interactive journey through Harry Potter and the Deathly Hallows - Part 1. Plus, revisit important moments from the previous films to prepare for the final battle that takes place in Harry Potter and the Deathly Hallows - Part 2. Dan, Rupert and Emma's Running Competition - While filming the escape scene from the Snatchers in Swinley Forest, Dan, Rupert and Emma engage in a little competition of their own. With colourful commentary by Director David Yates, see the competitive spirit on set and this hilarious rivalry between the three leads. The Seven Harry's - See how Daniel Radcliffe recreated the personalities of the different characters that transform into Harry's in the hilarious Privet Drive scene. On the Green with Rupert, Tom, Oliver and James - Accompany Rupert Grint (Ron Weasley), Tom Felton (Draco Malfoy), Oliver Phelps (George Weasley) and James Phelps (Fred Weasley) for a round of golf and get a glimpse into their 10-year friendship that developed while making the Harry Potter films. The Wizarding World of Harry Potter Promotional Trailer - Join Daniel Radcliffe, Rupert Grint, Emma Watson and other cast members from the Harry Potter films on their first visit to the Grand Opening of The Wizarding World of Harry Potter.